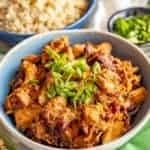 Easy slow cooker mole chicken has such a deep, rich flavor but is made really easy with a blender mole sauce. It’s perfect for tacos, rice bowls, wraps, quesadillas and more! I’m not going to even bother with the hellos and recaps today because we have had a weekend full of Hurricane Florence and I’m just trying to get through at this point. 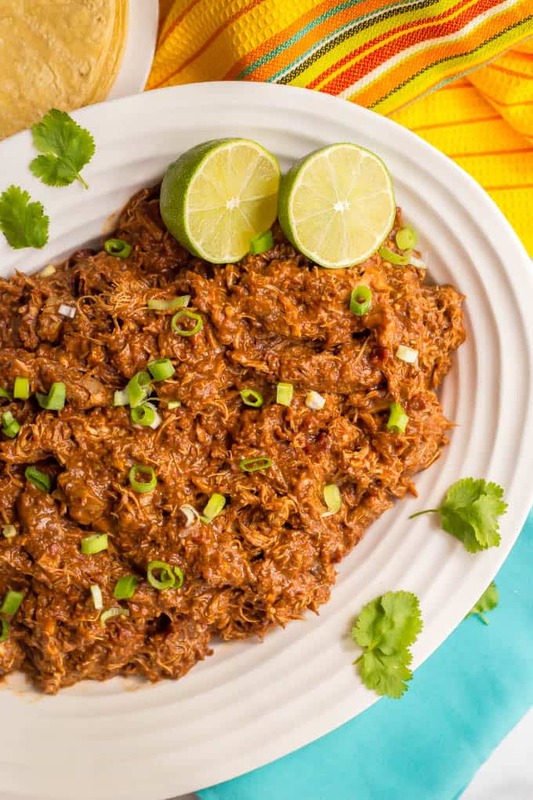 Today’s easy slow cooker mole chicken brings ALL the flavor. All of it. There’s no flavor left for anything else because this mole chicken is hoarding it all. It tastes that way at least. Now, I know mole sauce can sound intimidating and complicated – SO many ingredients! But I promise this one is super easy. Because we’re making a blender mole sauce. You pretty much just add everything to a blender and hit the power button. See, you can do this! And after it slow cooks with the chicken, this sauce gets rich and velvety and has an amazing and complex depth of flavor! I of course love making slow cooker mole chicken tacos with the shredded meat, cause tacos. 🌮❤️ But it’s also great for rice bowls (or cauliflower rice if you’re going low-carb) as well as wraps, quesadillas, nachos and more. I’m also thrilled to be partnering with Cacique® again and helping them celebrate Hispanic Heritage Month. Their cheeses, creams and chorizos are the perfect way to elevate your recipes and get some authentic, delicious flavors on your table. 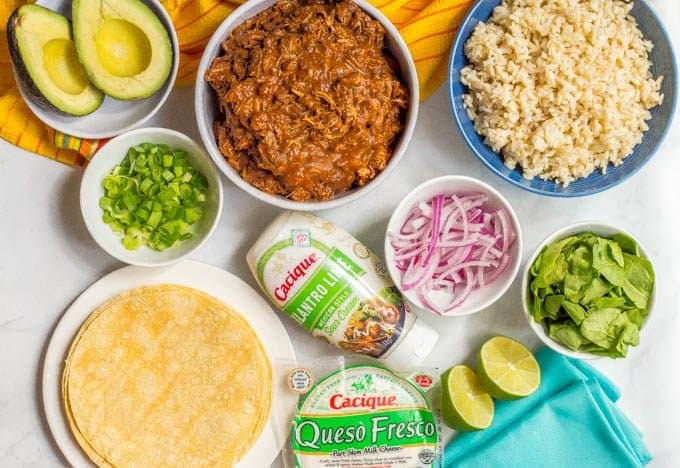 Cacique® products inspire you to create and share quick Mexican recipes that make it easy to savor the tastes and flavors of Mexican food without spending a long time in the kitchen. I used their crumbled queso fresco to top off my tacos and also highly recommend drizzling on one of their flavored cremas or sour creams. They add so much flavor! 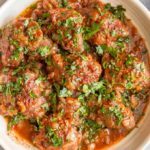 I use boneless, skinless chicken thighs for this recipe because I think they have more flavor in the slow cooker. You could substitute chicken breasts if you prefer. This is really saucy on day one. The leftovers soak up the extra sauce as they sit (which is great for keeping it moist while freezing and later reheating) so you do want to save it all. But if you’re making tacos and don’t want them to be soggy, just shred your meat and only add in as much sauce as you want to use the first night. Then mix in the extras with all the remaining sauce when you go to store it. Don’t forget the toppings! My must-haves are chopped fresh cilantro, crumbled queso fresco cheese and a drizzle of either one of the Cacique® cremas or flavored sour creams. It really takes these tacos over the top! 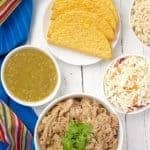 Other topping ideas: diced or sliced avocado, pickled red onions, chopped fresh onions or green onions and any of your other favorite taco toppings. This makes A LOT! It makes some delicious leftovers and it also freezes great, so be sure to save those extras for another night when you don’t want to cook. Happy Hispanic Heritage Month and I hope you give this easy mole chicken a try to celebrate. I think you’re gonna LOVE the flavor! 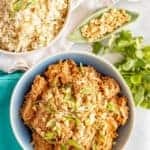 Easy slow cooker mole chicken has such a deep, rich flavor but is made really easy with a blender mole sauce! Season chicken thighs with salt and pepper and place in a 5-to-6-quart slow cooker. Heat oil in a medium skillet over medium heat. Add onion and garlic and sauce for 5-6 minutes, until softened. Add cooked onions and garlic to a blender along with the remaining ingredients (except the cilantro). Blend until smooth. Add the blended tomato mixture to the slow cooker, ensuring the chicken thighs are covered. Cook on low for 6-7 hours, until chicken is cooked through. Remove chicken thighs and roughly shred the chicken. 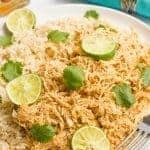 Return the shredded chicken to the slow cooker and stir to mix it into the sauce. Let it sit in the sauce, on the warm setting, for at least 10 minutes. Serve the chicken and sauce with fresh cilantro and crumbled queso fresco and drizzle with crema or sour cream. 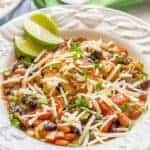 I use boneless, skinless chicken thighs for this recipe because I think they have more flavor in the slow cooker, but you could substitute chicken breasts if you prefer. Don’t forget the toppings! My must-haves are chopped fresh cilantro, crumbled queso fresco cheese and a drizzle of crema or sour cream. 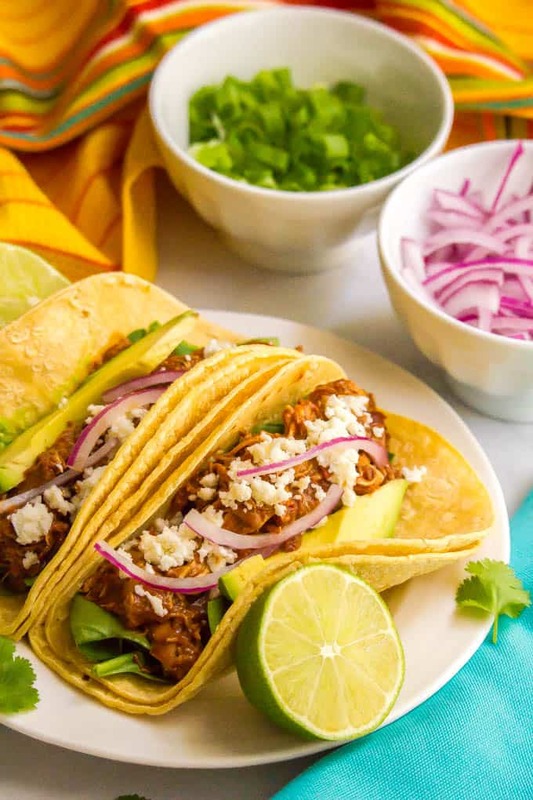 Other topping ideas: diced or sliced avocado, pickled red onions, chopped fresh onions or green onions and any of your other favorite taco toppings. Mmm,mmm – this is making my mouth water! 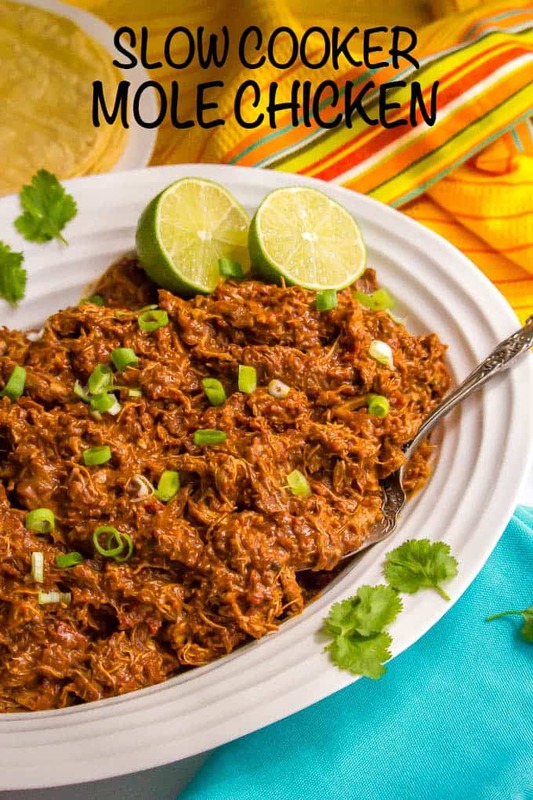 I love chicken mole but you just took it to a whole ‘natha level in the crockpot! I can’t wait to try this!